A collection of all 10 of our spice blends, lovingly created with all natural ingredients imported from around the world. Back for more! Absolutely love these blends of pastes and spices. I will never, ever buy shop bought jars or packets again..there is no need. Everything that I want in a decent curry, biryani etc comes in one of these little pots. Total convert. Absolutely the best!, just wished they were stocked in the major supermarkets which would be easier when I run out. Amazing pastes and spices that are free of anything nasty – well done Shemin and continued good luck although I know it’s all down to your hard work and effort. Purchased for my daughter and daughter in law at Christmas and they can’t praise them enough. The Indian curry pastes are easily the best on the market and the recipes as simple as Indian food can be. The taste is incredibly authentic. 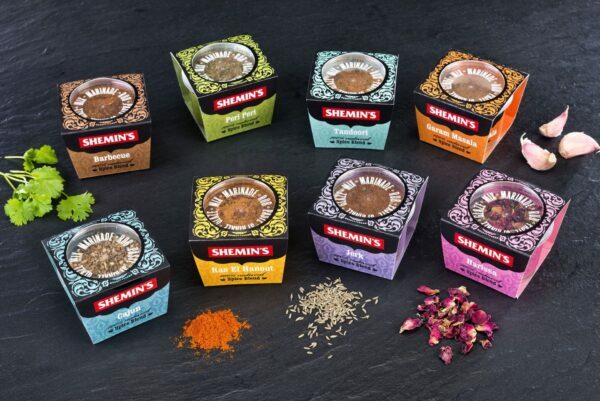 Love Shemin’s spices and pastes made from 100% natural ingredients because they have helped me to create the best curries and spicy food ever! Can be used in so many dishes making them very tasty and earning me lots and lots of compliments!! !